Protect your home against burglars to prevent making your property a target. Thieves love to lurk around at night and case out their next target. They specifically look for homes with trees and bushes that block windows (good for shielding the perpetrator) and have basically no lighting whatsoever outside of the home. A well-lit structure is a thief’s nightmare; so if you are known for the darkest house on the block; guess what? You are a burglar’s dream come true. According to the Austin police department, burglaries in Austin neighborhoods cost residents over 1.3 million per year in loss of property alone. Home burglaries occur every 14.3 seconds (over 6,000 burglaries a day!) in the U.S. More than 80% of all attempted burglaries are completed successfully; 81% of intruders entered on the first floor; 35% of intruders entered through the front door. Almost 40% of burglaries happen at night while most people are sleeping. Less than 13% of burglaries are solved. 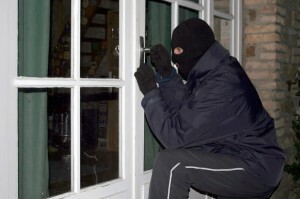 60% of burglaries occur while a home is occupied. The average home intrusion causes in excess of $2,000 in damages and that doesn’t include destruction or loss of priceless and irreplaceable family heirlooms. Armed with stats and what occurs daily in the wonderful world of news, why put yourself and your family at risk of becoming a victim of a home burglary? Imagine a thief entering your home with your family inside. “A Deltona couple had returned to their home at about 11 a.m. when they noticed a bicycle resting against the front door. They also saw that the door they had locked earlier was now busted open. When they went inside, the couple discovered the suspect inside their bedroom holding a hammer in one hand and a bag in the other. The husband was standing in the kitchen and demanded that the suspect come out of the bedroom. Although these particular crimes occurred in the day time, who’s to say the suspects weren’t there the prior night or weeks checking things out; learning the victim’s schedules; knowing where their valuables were in their homes because the suspects were able to view from the victim’s windows which may have been blocked by trees or shrubbery allowing the suspects full range of time to plot for the next day’s activity: entering their homes and taking their belongings. Adequate lighting and a manicured lawn aren’t the only solutions to the problem but are an excellent place to begin; so if you’ve been putting off replacing the light fixture outdoors; avoiding contacting your local energy company and reporting a few inoperative light posts near your home; or going outdoors and chopping down those bushes… you may want to think again. Your phone call or quick fix can potentially save you thousands of dollars in theft and don’t forget the trauma of facing a burglar in your home. 1. Install a deadbolt lock. Deadbolts are usually locked with a key from the outside and a thumb turn on the inside. The cylinder should be pick resistant. Lock your doors every time you leave the house, even if you’re leaving for just a few minutes during the day. The most popular times for residential burglaries are weekday daylight hours. In over 1/3 of burglaries, there is no forcible entry–someone forgot to lock the doors. 3. Keep garage doors closed and locked. Open doors and windows are commonly checked by burglars looking for an opportunity. 4. Secure sliding doors and windows. Cut a broom-handle to the length of the bottom track so that the window or door will not slide open when forced. Also, drill one hole through both casings and sliding window and insert a nail or pin. 5. Secure sash windows. To prevent wooden sash windows from being pried open, drill a downward sloping hole into the top of the bottom window through and into the bottom of the top window and insert a pin or nail. To prevent aluminum sash windows from being broken into, purchase a track lock that blocks the window track. 6. Mark your property. Mark your valuables with an engraver. Marking your property serves as a deterrent to would-be burglars and it helps police in identifying and returning stolen property. Make a property identification list. Put warning stickers on doors and windows. 7. Purchase a burglar alarm. A home alarm system can be a very effective burglary deterrent and fit into many people’s needs. Remember to test your system monthly. 8. Leave a light on. When leaving on trips, leave a light on in the bathroom. In the bedroom, attach a lamp and radio to a 24-hour electric timer set to go on at dusk and off at your bedtime. Close bedroom drapes or blinds. For more information or consulting on home security, contact SRS Services; our experienced professionals can assist you with any questions or concerns you may have.